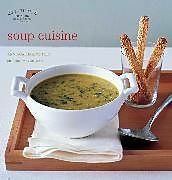 A guide to making tasty, wholesome, home-made soups from Paris From the smell of a steaming soup during a winter's lunch to an iced Gazpacho perfect for sipping in the shade in the height of summer, this adorable recipe book contains more than 30 delicious recipes for enticing soups that are great to enjoy year round. Preparation and cooking times run along the top of each page, and helpful appliances for making soup are also included. The only indispensable cooking appliance for a homemade soup? A handheld blender which will transform any boiled vegetable into a delicious smooth soup. Includes a conversion chart. A guide to making tasty, wholesome, home-made soups from Paris.